The Best Mining blogs from thousands of top Mining blogs in our index using search and social metrics. Data will be refreshed once a week. Also check out Mining Podcasts. Mining newsletter is a comprehensive summary of the day's most important blog posts and news articles from the best Mining websites on the web, and delivered to your email inbox each morning. To subscribe, simply provide us with your email address. Vancouver, B.C., Canada About Blog Mining news and commentary from around the globe. Daily updates on gold and commodity prices, exploration, mine development and mining company activities. Facebook fans 18,427. Twitter followers 45,126. Global About Blog Daily breaking news and a monthly magazine targeting leading global equipment purchasers with equipment reviews, mine reports, mining techniques and solutions. Facebook fans n/a. Twitter followers 32,561. Toronto, Canada About Blog The Northern Miner is a mining intelligence service offering authoritative and up-to-date reporting on mining, exploration and resource investment sectors. Facebook fans 5,751. Twitter followers 15,570. Johannesburg About Blog MiningNe.ws is a top international site with breaking news for the mining industry. The site has a powerful news aggregator that sources hundreds of international and local mining stories every day. Follow up keep up with mining and exploration projects in Africa and beyond. Facebook fans 10,495. Twitter followers 18,816. San Francisco, CA About Blog This is a blog for those involved or interested in the mining industry. Facebook fans 1,167,471. Twitter followers 526,512. London, UK About Blog The industry’s leading source of intelligence for global mining investment, finance and business. Facebook fans n/a. Twitter followers 32,332. Johannesburg About Blog Mining Weekly covers real-time news on mining projects across a range of minerals including gold, platinum, diamonds, copper and ferrous metals. This blog provides real-time news and information about developments in Africa’s premier industry. Facebook fans 7,301. Twitter followers 31,829. Sydney, Australia About Blog Australian Mining is the premier mining technology and equipment magazine in Australia. Get latest news and innovation in the mining industry. Facebook fans 42,726. Twitter followers 27,743. Perth, Western Australia About Blog Australia's leading source of daily mining and investment news. Facebook fans n/a. Twitter followers 5,049. South Africa About Blog Miningmx is a digital publication which provides independent news and analysis related to the African mining sector. The publication does not republish the content of other news vendors and focuses on producing best content through its network of independent journalists. Facebook fans n/a. Twitter followers 2,772. Australia About Blog Australia’s Mining Monthly is one of the largest, most authoritative mining news magazines produced in the Asia Pacific region. Papua New Guinea About Blog This blog was originally established to track the progress of the Ramu nickel mine in Madang Province, Papua New Guinea, but has since been expanded to cover the whole mining sector in PNG. Toronto, Canada About Blog This blog is an excellent resource for the mining supply and service technology clients and the historical profiles and latest information on mining globally. Facebook fans 77. Twitter followers 334. Malawi About Blog News, research and initiatives in Malawi's mining, oil and gas sector. Facebook fans 3,024. Twitter followers 2,873. France About Blog Keep up to date with the latest information of mining, metals and minerals. Facebook fans 1,300,418. Twitter followers 3,584. Africa About Blog African news and information on Mining for a global audience. Facebook fans 267,929. Twitter followers 332,132. Canada About Blog Keep updated with latest news and information about mining sector. Facebook fans 176,517. Twitter followers 59,800. Johannesburg About Blog Mineweb is the world's top mining and mining investment news website and is read in some 200 countries daily by mining company executives, financiers and investors. Facebook fans 832. Twitter followers 19,258. Delhi, India About Blog Keep up to date with the latest information of Mining. India Environment Portal (IEP) is the virtual gateway for information on environment and development from India, South Asia and across the world. managed by Centre for Science and Environment (CSE). Facebook fans 4,396. Twitter followers 4,738. Hallsville, Texas About Blog 3D-P knows mining communication technology. Our networks are ideal for the tough environment of surface mining and our technology works on any platform. Facebook fans n/a. Twitter followers 387. About Blog Mineweb.net – Dedicated to help anyone looking for alternative investments, whether it is gold, silver or any other precious metal. With a expertise in unconventional financial plans we are here to offer advice, guidance and support. Spokane, WA About Blog The American Exploration & Mining Association, est. 1895, is a 2,500 member non-profit, non-partisan national trade association based in Spokane. Facebook fans 1,172. Twitter followers 1,321. About Blog Pure Gold is a growth company. Our mandate is pure and simple. To dream big. To colour outside the lines. To use smart science and creativity to unlock the next multi-million ounce gold discovery. And become Canada's next iconic gold company. Zambia, Africa About Blog The Zambian Mining Magazine is a premier source of news on mining developments in Zambia’s most important industry. The Zambian Mining Magazine provides in-depth coverage of mining projects and the personalities reshaping the mining industry in the country. Facebook fans 1,721. Twitter followers 72. South Africa About Blog Keep up to date with the latest information on Mining. Facebook fans 16,588. Twitter followers 319,017. London About Blog London Mining Network works in support of communities around the world who are badly affected by mining – mining by companies based in, or financed from, London. Facebook fans 2,019. Twitter followers 6,309. Cheyenne, WY About Blog The Wyoming Mining Association serves as a unified voice, providing value at a reasonable cost to its membership, by communicating, influencing, and promoting issues on behalf of the mining industry. Facebook fans 1,851. Twitter followers n/a. Anglesey, North Wales, UK About Blog Anglesey Mining plc - LSE main board listed - has interests in Parys Mountain in Anglesey (UK), Grangesberg Iron in Sweden and Labrador Iron Mines in Canada. Facebook fans n/a. Twitter followers 228. Maputo/Mozambique About Blog The most exclusive news related to them most recent developments in the mining sector of Mozambique (Coal, Iron ore, copper, diamonds). Facebook fans 99. Twitter followers 1,087. Del Mar, CA About Blog Site dedicated to investing in Gold Mining Stocks.Finding top undervalued stocks poised for explosive returns on investment.We market and promote top miners. Facebook fans n/a. Twitter followers 213. Facebook fans 1,001. Twitter followers n/a. About Blog Caesars Report is an online mining portal specialized in (junior) mining companies. We cover undervalued stocks with an acceptable risk/reward ratio. Facebook fans 269. Twitter followers 1,795. Washington, D.C. About Blog Minerals Make Life is a National Mining Association initiative created to share information about domestic minerals mining and its importance to the economy, innovation for the future and national security. This initiative will educate America’s policymakers, influencers and the public, and enable them to make informed decisions about U.S. mining. Facebook fans 103,897. Twitter followers 11,697. New York, USA About Blog The Gold Investment Letter helps sophisticated investors maximize profits in gold/silver stocks with unbiased, specific, and actionable recommendations. Facebook fans 645. Twitter followers 2,104. Vancouver About Blog We cover the latest news on mining stocks. Facebook fans n/a. Twitter followers 5,447. Zimbabwe About Blog Mining Zimbabwe Magazine is a publication focused on the mining industry of Zimbabwe and how it relates and affects the rest of mining done in other African countries. The magazine’s core focus is on the ever evolving face of the mining industry, trends, new technologies being developed and used to improve this crucial sector, as well as new opportunities and investments arising from it. Facebook fans 5,556. Twitter followers n/a. Africa About Blog The Official Mining in Africa Country Investment Guide. Johannesburg, South Africa About Blog We manufacture and design site specific Dust Control Management and Dust Suppression systems for the mining and industrial sectors. Facebook fans 287. Twitter followers 255. Québec, Canada About Blog The MinesQC.com blog is a space for exchange and debate where different points of view related to the mining sector are expressed and discussed. Men and women from a variety of backgrounds, including representatives of the mining industry, of interest groups, researchers, teachers, students, and independent experts from different backgrounds present their ideas and back them up with documentation. Facebook fans 28,947. Twitter followers 1,708. Vancouver, BC About Blog Newsletter Dedicated to Uncovering Value, High-Quality Ideas in Natural Resource Stocks. Facebook fans 483. Twitter followers 1,763. Minnesota About Blog PolyMet Mining Corp. is a publicly-traded mine development company focused on permitting, building and operating the NorthMet copper-nickel precious metals project through its wholly owned subsidiary, Poly Met Mining, Inc., a Minnesota corporation, together known as PolyMet. Facebook fans 3,311. Twitter followers 715. About Blog The blog page displays a series of 24 h graphs of the precious metals (gold, silver, platinum and palladium) both in USD/Oz and in EUR/Kg. Follow to know more. Alaska, USA About Blog We are a family of gold miners operating from Quartz Creek, Alaska. We sell paydirt to help realize our dream of running a full-time, debt free mining operation. Please enjoy our blog posts and share in our adventures. Facebook fans 6,929. Twitter followers 256. Peoria IL About Blog Caterpillar is the world’s leading manufacturer of construction and mining equipment, diesel and natural gas engines, industrial turbines and diesel-electric locomotives. We are also a leading financial services provider through Caterpillar Financial Services. Facebook fans 1,310,978. Twitter followers 114,741. About Blog Amazing mega construction and mining machines in action. Excavators, Dump Truck, Bulldozer, Hammer machines and many more. Facebook fans 195,678. Twitter followers 45. Washington, D.C. About Blog The Advocacy Campaign Team (ACT) for Mining is dedicated to helping mining community supporters make their voice heard with key decision makers in Washington, D.C., and state capitals across the nation. Facebook fans 392,525. Twitter followers 18,753. United States About Blog Come and explore dark, dangerous, abandoned mines where you'll swear you can smell the dank air; hear the rumblings of the old, underground machinery; and feel the miners' presence as they relentlessly chased their dreams of gold and untold fortune. Facebook fans n/a. Twitter followers 534. United Kingdom About Blog Exploring some of Cornwall's mines above and below ground in videos. Our team consists of ex miners, cavers and mine rescue, every trip is taken with caution and callouts made to other members of where we are underground. Facebook fans 548. Twitter followers n/a. New South Wales, Australia About Blog The NSW Minerals Council is the leading industry association representing the state’s minerals industry, providing a united voice for our members. Mining has and will continue to be a key economic driver for the state. That’s why the NSW Minerals Council works closely with government, industry groups and business and community leaders to foster a sustainable mining industry in NSW. Facebook fans 8,481. Twitter followers 6,070. Facebook fans 2,844. Twitter followers n/a. Miami About Blog Gold Stock Trades Editor Jeb Handwerger is a highly sought-after stock analyst and best selling writer syndicated internationally and known throughout the financial industry for his accurate, in depth and timely analysis of the general markets, particularly as they relate to the precious metals, nuclear and rare earth sector. Facebook fans n/a. Twitter followers 2,679. About Blog The Justice in Mining Network works to protect human rights and the environment, and seeks to ensure mining only occurs where issues of equity and sustainability are addressed. The Justice in Mining Network will support and advocate on behalf of local communities affected by mining activities, and will lobby on human rights issues where appropriate. Facebook fans 200. Twitter followers n/a. London, United Kingdom About Blog The Universal Mining Group are now independent consultants in the Mining, Resources, Energy, Manufacturing and Industrial Arenas. They offer a complete bespoke service for mining and energy projects. Subscribe to keep up with the latest updates from this blog. Eureka, Nevada About Blog A morning report on equity and commodity markets tailored for mining interests in Eureka County, Nevada, and surrounding areas. Over 800 reports since March, 2009. Gujarat, India About Blog It is a blog about mining engineering for mining engineers and students of mining engineering. A very important blog for mining engineers. Facebook fans 1,897. Twitter followers n/a. Canada About Blog This blog discusses trends and developments in mining law in Canada and internationally; offers practical suggestions and insights on developments that affect the players in the industry; and provides guidance on how to address various challenges and opportunities in the life cycle of mining companies. Facebook fans n/a. Twitter followers 5,860. About Blog Junior Gold Miner Seeker aims to provide "pages" following key themes for successful investment in the Junior Gold and Silver Mining and Exploration space without having to follow long posting threads. U.S.A. About Blog Mineral Law Blog shares our knowledge, passion, observations and insights regarding minerals and mineral law and information on the Oil, Gas, Pipeline, & Mining industries. Facebook fans 457. Twitter followers 3,465. British Columbia, Canada About Blog Mining & Money (M & M) intends to become the go to site for mining investors. We strive to serve Private & Public Funds, Banks, Angel & Small Investors, Junior Miners and generally speaking we do due diligence for anyone interested in investing in a sector renowned for being high risk high reward. Facebook fans n/a. Twitter followers 3,273. 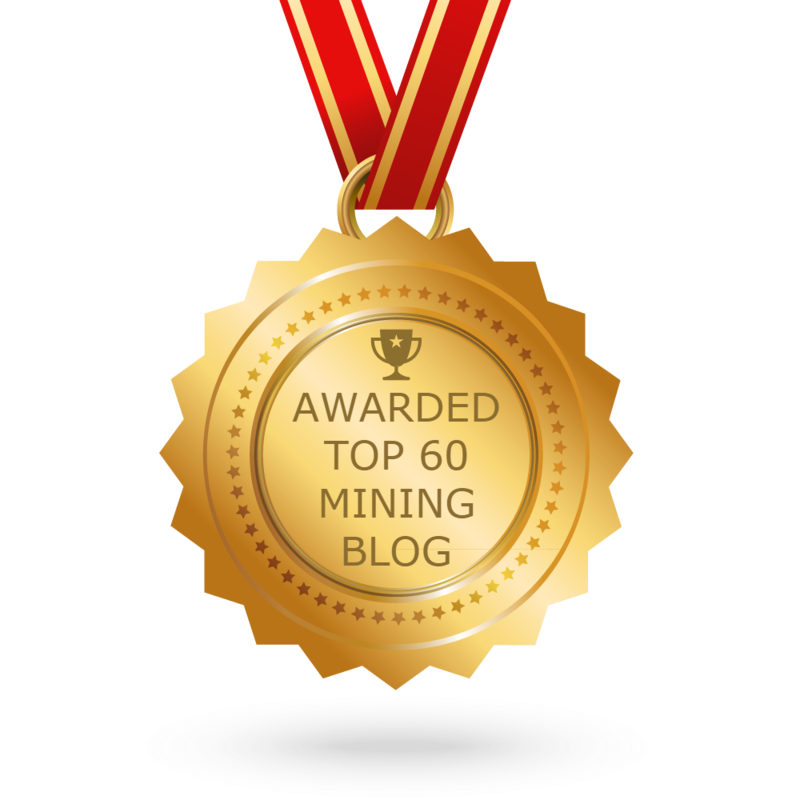 CONGRATULATIONS to every blogger that has made this Top Mining Blogs list! This is the most comprehensive list of best Mining blogs on the internet and I’m honoured to have you as part of this! I personally give you a high-five and want to thank you for your contribution to this world.